For many people taxes are a total pain. I get it. Once a year you’ve got to scramble to gather up all of your documents, then sit down and sift through numbers and try to figure out what’s going on. Just the thought of it can stress you out. 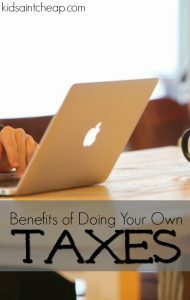 However, if you choose to look at doing your own taxes in a different light you’ll see that there really are some major benefits and that filing yourself is not as hard as you may think. Here are the biggest benefits of doing your own taxes. Would you be shocked to learn that only 40% of US adults keep a written budget or track their expenses and almost two-thirds of American families live paycheck to paycheck? Having a better awareness of your financial situation is the first step in making improvements to your personal finances. Doing your own taxes can help you get a closer look at where you stand. When you file your own taxes you’ll be taking a good hard look at how much you and your spouse earned last year, the investments you’ve made and any capital gains you’ve earned or lost, how much you’ve paid in interest on your mortgage or student loans and so much more. You can get a big picture of where you stand in one day by simply doing the work yourself. This is an enormous benefit. Tax software these days is pretty great. It walks you through the tax filing process step-by-step all while teaching what you need to know to make the most out of your tax situation. You’ll learn about credits and deductions and will be more prepared when it comes to do your taxes next year. You’ll also know exactly what you need to file your taxes and will be able to prepare accordingly. As a bonus most tax software comes with maximum refund guarantees and accuracy guarantees if you’ve entered in all of your information correctly. Filing taxes yourself is a very simple process thanks to tax software. With good tax software, like TaxAct, you’ll be given prompts that will tell you exactly what to enter from each of your tax forms. When you’re done you’ll be able to run alerts which will scan through your information and look for any potential problems. If you’ve got a simple tax situation filing taxes yourself is a very straightforward process. Even if your situation is slightly more complex you can still easily do taxes yourself by following the prompts and answering the questions. Collect Everything You Need – Before you sit down to do your taxes gather up all of your documents so that they’re right in front of you. This includes things like income documentation, interest and investment tax forms and personal information of any dependents you’ll be claiming. Choose the Right Software – Look at all options on the tax software you’ll be using and select the one that is most applicable to your situation right from the start. This will save you from having to upgrade half way through the process. Check Your Numbers and Run Alerts – After you’ve entered all of your information go back through and double check your numbers and then run all alerts. Fix any problem areas and then file. After that you’ll be done with your taxes and can walk away with a better understanding of your financial situation and the sense of satisfaction that comes from doing something yourself.